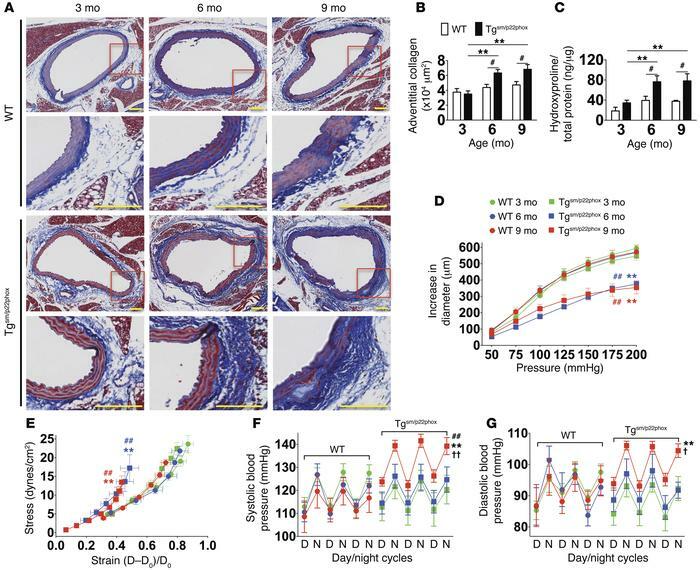 Tgsm/p22phox mice develop age-related aortic stiffening and hypertension. (A) Effects of aging on vascular collagen deposition in WT and tgsm/p22phox mice. Perfusion-fixed sections of the thoracic aortas were sectioned (6 μm) and stained with Masson’s trichome to highlight collagen (blue). Areas within the red boxes were magnified (×20) and shown below the original images (×6). Scale bars: 100 μm. (B) Adventitial collagen area was quantified by planimetry. #P < 0.05 vs. WT; **P < 0.01 vs. 3 months. (C) Aortic collagen quantification by hydroxyproline assay. (D and E) Freshly isolated aortas were mounted on a myograph system in Ca2+-free buffer to determine pressure-diameter relationships. Stress-strain relationships were constructed from intraluminal pressure, wall thickness, and inner and outer diameters. These parameters were measured at 25 mmHg step changes in pressure from 0–200 mmHg. **P < 0.01 vs. Tg 3 months; ##P < 0.01 vs. WT. (F and G) Telemetry blood pressure of WT and tgsm/p22phox mice at 3, 6, and 9 months of age. †P < 0.05 vs. Tg 6 months; ††P <0.01 vs. Tg 6 months. Data were analyzed using 2-way ANOVA; n = 6–9.